Free legal representation for first offense marijuana possession. Tulsa City and County Courts only. Reasonable fees for other charges. Since last century I’ve been making the offer to represent defendants on marijuana charges with the phrase that I’m FREE TILL IT’S LEGAL. Lately, an imposter has been using the phrase “Until it’s legal…” on a VW van, with a phone number that mimics mine. Don’t be fooled. He recently left the DA’s office, where he had the job of prosecuting people for marijuana charges. And there’s nothing “free” about him. 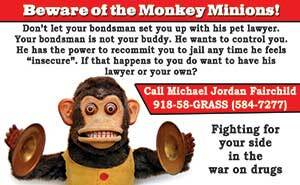 And although he has marijuana leaves and various phrases implying his prowess on the van, it’s just a franchise he got from a REAL drug lawyer in OKC. Don’t accept imitations. Make sure your lawyer has gray hair and a name you can pronounce. You know me. Since last century I've been protesting the War on Drugs by offering my services free to local first offenders in trouble for the first time. I'm "Free Till It's Legal*". Recently the Tulsa jail was full and only certain offenders were arrested due to lack of space. I'm sure all of you out there think that all the pot smokers were out of the stream of those to be arrested. I'm not here today to ask that we legalize marijuana, but to call for a City of Tulsa ordinance against drug paraphernalia. There's a hole in our city laws, which we need to change. Currently, possession of marijuana is illegal under city law, but possession of paraphernalia is not. 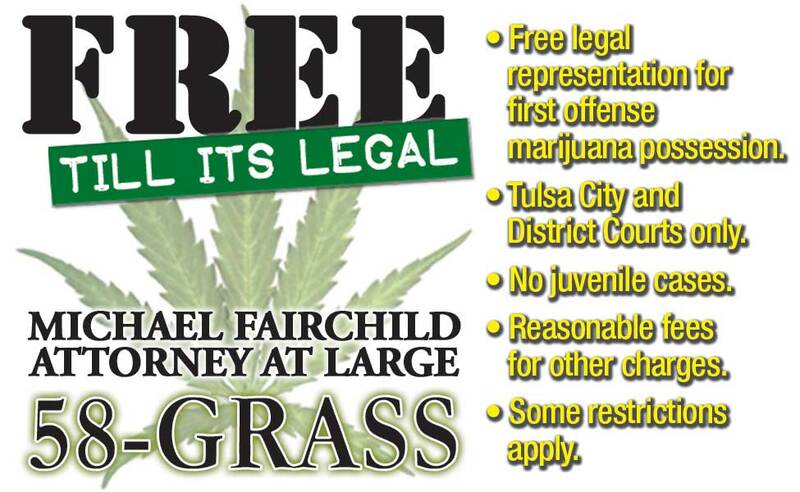 Therefore if a Tulsa Police officer finds someone with pot, he can issue him a ticket. If he finds someone with pot who also has a pipe or rolling papers, he has no choice but to arrest him and charge him under the Oklahoma State statute against paraphernalia. If paraphernalia were illegal under city law, the Tulsa officer would have the power to issue citations instead of arresting, if he chose. In city court, possession of pot will get a first offender six months of probation, five days of community service, and cost about $350 in fees, before his record can be expunged. The state courts have a much more severe punishment for marijuana crimes. In state court possession of pot and paraphernalia will require 18 months of probation, payment of $40 a month to the District Attorney which is $720, fifty six hours of community service and payment of costs and fees which may run another $1500 before the Court would consider expunging the sentence. 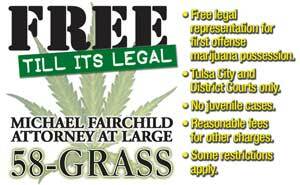 All the surrounding smaller communities have such a law, but Tulsa does not. Tulsa municipal court is losing out on a good revenue stream, which is filling out jail. So call your city councilor and ask that this hole in our laws be fixed. I'm an attorney. I've had an ad in the back of the Urban Tulsa for years, and have represented many of your people. I'm sure that you and most of Tulsa assume that if we are having to kick people out of the jail, that we've already taken steps to make sure the pot smokers aren't sent to jail in the first place instead of others who may have done worse. Possession of marijuana is against city law. Possession of paraphernalia is surprisingly not against any city ordinance. So if a Tulsa officer comes in contact with someone who has pot, he can write him a ticket to city court. If he finds one with pot AND a pipe or rolling papers, he has to book him into the county jail so that he can be charged under the state paraphernalia law. We need an ordinance against drug paraphernalia, so all the pot cases can be kept in city court. I'm not asking that you legalize anything. I'm asking for a ordinance just like the state statute against paraphernalia, that would allow all those cases to be kept in city court. This would give the TPD the additional power and discretion to issue citations when they chose, and save the room at the jail. All the surrounding communities have such ordinances and they keep their mj cases in their city courts. Only Tulsa is losing that revenue. I have discussed this with Bob Garner and all the city judges, and none have raised any objection or voiced any reason why we don't already have such an ordinance. I discussed this also with Chief Jordan and he said that he thought it might be a good idea, but it wasn't his job to change the law. I guess that's your job. If a marijuana activist like myself and the police chief agree, it's got to be a good idea. How can we get this accomplished? Sounds good. I’ll get a meeting set up with legal to discuss the ordinance. Just help me to communicate to the pot smokers that I’m on their side and that I’m not cracking down on them. I wish we could just legalize it and move on with life, but that’s not happening here any time soon. I have an idea that will keep more police on the streets as well as raise money for the city. Currently, while marijuana is illegal under both city and state law, there is no city ordinance against drug paraphernalia. Thus, while an officer can write a city citation for possession of pot, if the defendant also has cigarette papers or a pipe, the officer has no choice but to arrest him and charge him under state law for the marijuana and paraphernalia. This takes the officer off the streets while he drives the defendant to the jail and goes through the booking process. A source at the jail tells me that can be over an hour, plus the travel time. Let’s figure up to two hours wasted when the officer could have been arresting serious criminals. Additionally, the money that the defendant ends up paying in fines and probation fees for possession of pot and paraphernalia is now going to the state and county coffers instead of the city. Currently for a marijuana ticket the city typically takes in $350 and gains five days of community service from each defendant during his six months of probation. Paying a fine for paraphernalia would probably be almost an equivalent amount of city revenue. By way of disclaimer, let me identify myself as an activist for the reform of marijuana laws. I am urging this because the current fees charged in the county system are outrageous. Currently a marijuana and paraphernalia defendant in the county court will be on probation for eighteen months and have to pay fines and assessments around $2,000. The Tulsa County District Attorney’s Office charges each defendant at least $480 in fees for it’s own probation department. Additionally defendants will be typically required to do eight days of labor for the county. Passing a paraphernalia ordinance would allow the officer to choose to write citations when he thought they were deserved, bring more revenue to the city, and more fairness to the system. SHOULDN'T OUR DRUG LAWS MAKE SENSE? Alcohol kills. Tobacco Kills. Marijuana is illegal. Alcohol and tobacco are addictive. Marijuana is illegal. Why does Congress classify marijuana as having no medicinal benefit when doctors and scientists recognize its value for chemotherapy patients, AIDS patients, glaucoma sufferers, and those who have MS, to name a few? Past the buckled, weed-lined sidewalks of a northwest Tulsa neighborhood, sitting in the most remote room of an old oil-boom mansion, the attorney who would sue other attorneys works alone. No invitations to lawyers' posh parties lie about his desk. No job offers from large legal firms sit in his mail bin. Not that he's all that interested. Michael Fairchild is the attorney who, in his recent newspaper advertisement, encouraged people to "Bite back!" and "sue your lawyer." More than 50 attorneys angered by the ad have complained to the Tulsa County Bar Association since the ad first ran late last month, said Bill Jacobus Jr., president of the county bar. Other complaints have been lodged in a less official manner. Fairchild said a woman who would not identify herself called him and warned, "You better be looking over your shoulder." His children found a box of spent rifle shells on the front walk, he said. A friend told him he saw his ad posted in the district attorney's office of a neighboring county with an attached memo: "No deals, no considerations for this viper." "Hire a cannibal," it reads. "I sue other lawyers." The 41-year-old attorney drew a long breath on his cigarette, then smiled as the smoke escaped the upturned corner of his mouth. "I don't intend to back down," he said. For moral support, Fairchild said he looks to the the 20 or 30 calls a day he said he received from people other than attorneys. Many of the callers didn't even have a complaint about an attorney, he said, but simply wanted to tell him to go get 'em. "It's nice to be a hero, and that's the feeling they (the callers) give me," he said. Fairchild said he has not taken any attorneys to court yet but is investigating 20 claims of malpractice. At least ten of them are what he calls "good cases," and he said he plans to file three cases by the end of this week. Taking on legal malpractice as a specialty is unusual, said law professor Judith Maute of the University of Oklahoma. But going a step further and advertising it is "very unusual," she said. "It's usually very difficult for someone who thinks they have a malpractice case to get help," Maute said. "They typically are unpopular cases (for an attorney) to take on because of the notion of professional courtesy." Maute, who studies and teaches professional responsibility and ethics, said Fairchild's shark ad may seem inappropriate to some people because "it implies lawyers bite to begin with, and it seems to call for retaliation." Maute said it would not suprise her if Fairchild is getting favorable public reaction. "The public has very ambivalent feelings about lawyers," she said. Jacobus said ads like Fairchild's perpetuate the misconceptions and ill feelings concerning lawyers. "If someone were to run an ad saying, `sue your doctor,' I guarantee you'd hear people screaming up and down the streets," he said. "But say, `sue your lawyer,' and everyone sits back and thinks that's kind of funny. It casts us all in a bad light." Why does New Jersey have more toxic waste dumps while California has more attorneys? New Jersey got first choice. Fairchild thinks those kind of jokes are funny. 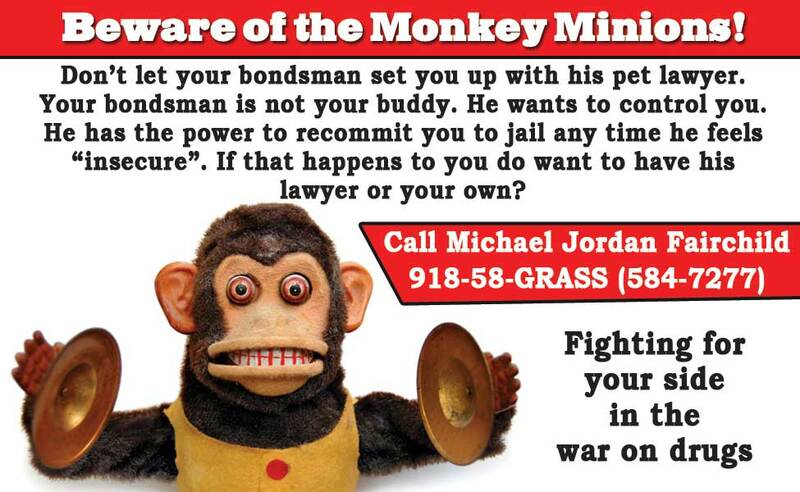 He said his ads were intended to be funny - but not to other attorneys. "I've always considered myself somewhat of a maverick," he said. Originally from Cincinnati, Fairchild graduated in 1973 from the University of Tulsa law school where he and some friends spent part of their time publishing an underground newspaper called "Cheap Thrills," he said. Fairchild has been married for 16 years to his wife, Libby. He has an 18-year-old step-son, and he and Libby have two children, ages 9 and 7. Over the years, he has had partners in his general and criminal law practice, but he said he never wanted to be part of a big firm. "It's never appealed to me. I've never wanted to be part of the club. I've no interest in society events." He said he began considering specializing in legal malpractice a couple of years ago because so few people were doing it and he saw a potential niche for himself. A Yellow Pages ad in last November's book brought little response, he said. Then he placed the newspaper ad, complete with a picture of a shark fin, telling people to "Bite back!" The public's reaction to the ad has not surprised him, Fairchild said, but the number of complaints the bar reported from attorneys has. "I hadn't realized the hypocrisy of the bar association in general," Fairchild said. "I'd like to hear one argument against the ad that makes sense to a layman. The reason the bar is so upset is because this is their worst nightmare come true. "I don't think attorneys should be exempt from lawsuits." Attorneys offended by the ad say it is not the question of suing attorneys that is offensive, but the nature of an ad they say recklessly incites lawsuits. 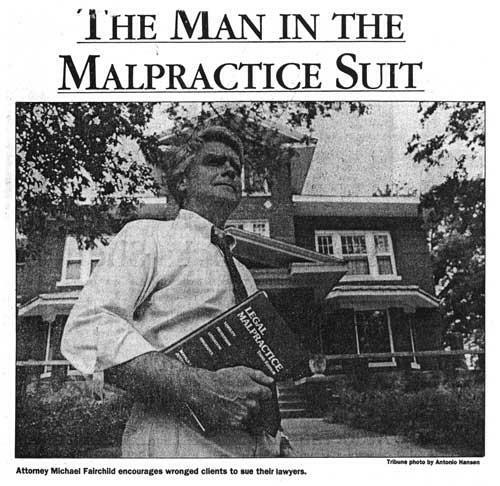 "There should be attorneys to take malpractice cases," said Tulsa attorney Jim Frasier, "but I think (Fairchild's) ads are in very poor taste." Fairchild said an attorney friend - one who still is his friend - told him he thought Fairchild was "committing professional suicide." Another friend, he said, told him 99 percent of the lawyers in town are out to get him. "Well, I'm out to get them, too," Fairchild says. "So, I guess we're even."